Preheat oven to 400. Slice bell pepper into ¼-inch pieces. Toss with onions on a baking sheet, along with olive oil, salt & pepper. Place in the preheated oven, and set a timer for 10 minutes. Meanwhile, in a mixing bowl, combine ground beef with all or some of chistorra spices (see note) along with a bit of salt & pepper. Use your hands to roll into golf ball sized meatballs. Set aside. Heat a small amount of olive oil in a nonstick skillet over medium heat. Place meatballs in pan, leaving space between each meatball. Turn every minute or so until all sides have browned thoroughly. When the 10 minute timer is up, transfer meatballs to the baking sheet with the onions & peppers, continue to roast five minutes or until meatballs are cooked through. Meanwhile, rinse and drain chickpeas. Use a paper towel to wipe out the pan you used for the meatballs, and add a very small amount of oil. Heat again over med-high heat and add the chickpeas. Season with salt & pepper and sauté about 3-4 minutes, until they begin to turn golden brown. Pour vinaigrette base into the bottom of a salad bowl along with an equal amount of olive oil. Whisk or mix with a fork to combine. Add spinach, grated carrot, and toasted chickpeas to the bowl. Toss gently. Divide onions & peppers between plates and top with chistorra-spiced meatballs. Enjoy the spinach salad on the side. Notes: Chistorra spices are similar to flavors in chorizo — smokey and garlicy, but not very spicy/hot at all. 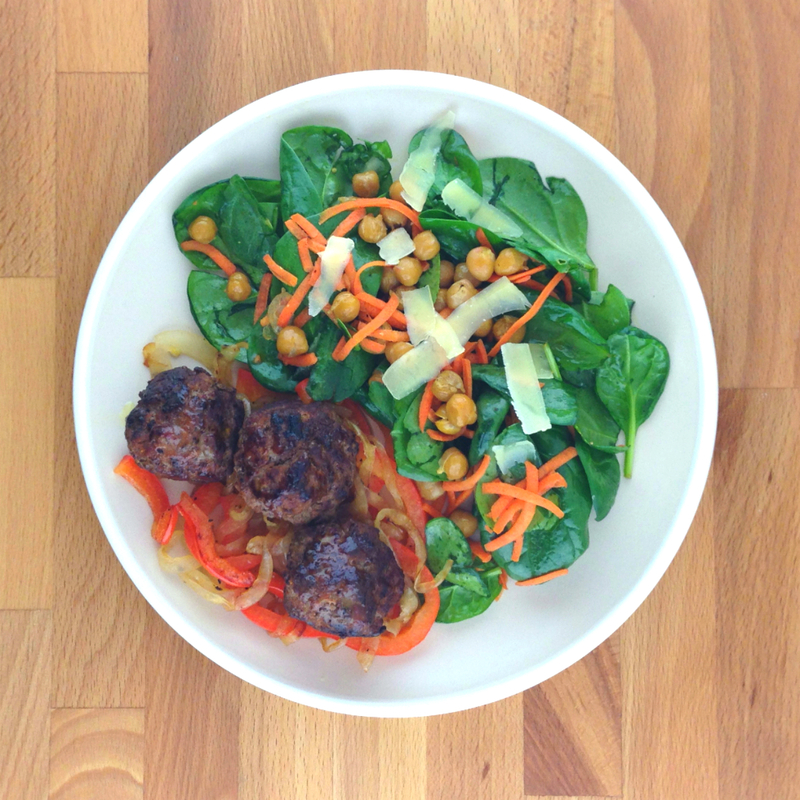 This entry was posted in Beef, Meal-Kit Recipes, Meat on February 7, 2016 by Megan Rappe.